Get your selfie sticks ready! Milledgeville is a great place to snap a selfie, an usie (aka 2 or more people in selfie form), or maybe just snap a quick shot of the landscape. Whatever you choose, the picture is going to turn out great! The Old Governor’s Mansion: Hosting weddings, luncheons and dinner parties regularly, the Mansion is a great place to snap your picture! 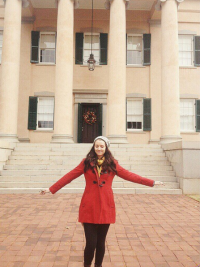 With its beautiful High Greek Revival architecture, the Mansion is a salmon color so plan your outfit accordingly! Whether you want to hug one of the giant columns out front, take a selfie by the GIANT Christmas tree that goes up in November or maybe just want to lounge under the big tree in the front yard, you will always get the perfect shot. The Fountain on the Georgia College Campus: Take a step onto this beautiful campus and you are sure to find some great selfie spots. 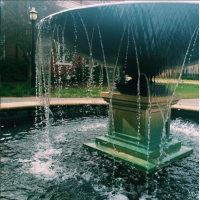 Located in the center of campus, the fountain is a constantly busy area. With students chatting, reading and even napping (don’t say we said anything! ), this is a great spot to get a real feel of Georgia College lifestyle. They even change the colors of the fountain relating to what time of the year it is! For October, the fountains water was pink for Breast Cancer Awareness month! Whether you choose to sit or stand (just don’t get in it, please! ), you’ll capture a great shot here! 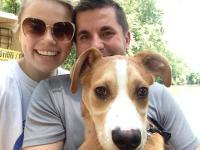 Historic Rose Hill and Lockerly Arboretum: Grab your furry friend and take a selfie at this quiet getaway away from the hustle and bustle. Take a stroll through the rustic trails or snap a selfie next to the gorgeous pond in this property. You can even have someone snap a picture of you next to the old time water well located inside a cabin on the property. Fall also brings beautiful flowers such as Purple Coneflower and Pansies, so make sure to snap selfies with those as well. Escape to this private little getaway and get some prime selfies! 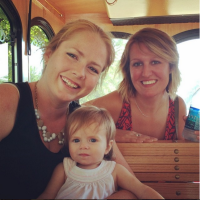 Riding Milly the Trolley: The trolley tour is a MUST DO when you are visiting Milledgeville! Milly the trolley looks vibrant in selfies, so she will definitely be up for snapping one with you. Spots on the tour are also great places to take selfies, such as St. Stephens Episcopal Church and the Brown-Stetson-Sanford House. If you are lucky enough to be in Milledgeville during the month of October, the Haunted Trolley Tour is also a great spot to snap a selfie while you are getting spooked by the undead of Milledgeville. Get those cameras ready, the trolley tour is going to have you snapping selfies left and right!